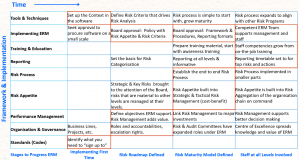 Test of Time; years ago, CorProfit prepared a SDD (Software Design Document) and employed a team of software engineers to develop the KnowRisk® platform, one of the first operational risk management systems to be developed globally. The Intellectual Property that we believed was appropriate then has stood the test of time, and continues to be relevant now. CorProfit was ahead of the game. If you wanted to commence your Risk Management journey now, the proven CorProfit methodology gives you a strong and practical foundation to start with and provide all the flexibility and adaptability to cater to your unique business model. No other company can claim to have the depth of implementation, knowledge and experience the CorProfit team has. The global conundrum around strategic business practices is the divide between consulting services and technology solutions. On the one hand consulting companies leverage the time that they offer, seeking to maximise your Risk Management experience through services to companies. While on the other hand a software developer seeks to offer automation and thus efficiencies to the same company. CorProfit is the perfect equilibrium; we have strong and proven core expertise in design Risk Frameworks and Implementation Plans, with IP that is embedded in the KnowRisk® platform. We also work in conjunction with a range of professional consultants that add value into and complement CorProfit.